Roma Porta San Paolo is the terminal train station of the Rome-Lido railway line in Rome (Italy). 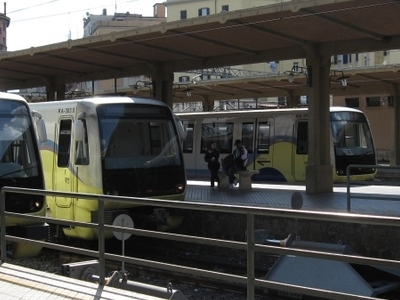 The station is connected to the Piramide station of the metro (line B) and to the Roma Ostiense Railway Station of the Ferrovie dello Stato Italiane. It has six rails. The edifice houses the ticket office and service structures, as well as a news-stand and a coffee shop. It also includes the Porta San Paolo Railway Museum. The building of the station was started, together with the one of the railway, at the beginning of 1919, after the inauguration ceremony of 30 December 1918 in the presence of Victor Emmanuel III. The station was designed by Marcello Piacentini. A quite similar one was the Ostia Nuova terminal train station, whose foundation stone was laid on 10 December 1920, also in the presence of the King, and that was destroyed during the war. Here's the our members favorite photos of "Railway Stations in Rome". Upload your photo of Roma Porta San Paolo Railway Station!